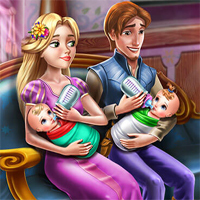 Spend a wonderful family day with Rapunzel, her husband and their twins! The house is a mess so first, help the princess tidy up. Dust, clean up the windows and gather up the toys and the dirty diapers. Now that everything is set, start taking care of the babies. You can learn how to feed them, play with them and have fun on this cute sunny day!